Over the years, images of large Bay Area sports venues, like Candlestick Park and ATandT Park, have been linked to their proximity to the San Francisco Bay. 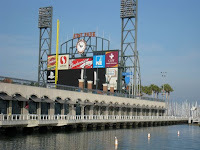 Both these stadiums -- home to the San Francisco 49ers football team and the San Francisco Giants baseball team, respectively -- are on the Bay Trail. There are also numerous smaller sports facilities and ball fields close to the Bay Trail. Fishing and kayaking are inextricably linked to Bay waters. 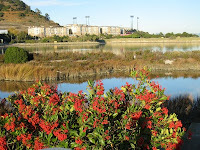 There are fishing piers or fishing areas in all the San Francisco Bay Area counties I've walked through so far. 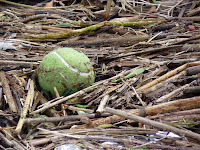 As I walk around the Bay, I can't help but note the presence of all kinds of balls in or near the water. Balls float, and so they travel around the Bay -- becoming roving ambassadors for their respective sports. Tennis; soccer; baseball, softball and whiffleball; basketball and football balls. 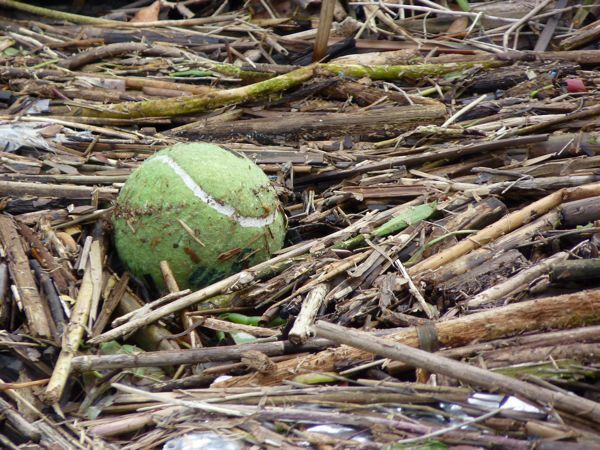 I've created a special "Balls in the Bay" series that includes photos of balls from all these sports, and more.